A meniscus is a cartilage structure that provides shock absorption and cushioning in the knee joint. There are two menisci. They are located in between the thigh bone (femur) and the shin bone (tibia). Meniscus tears are very common among tennis players. They are often the result of a twisting injury. 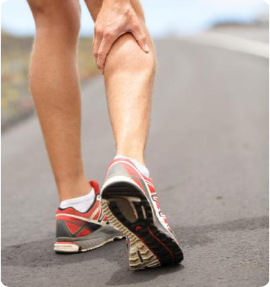 When a patient has a torn meniscus, he or she usually complains about sharp pain in the knee. A torn meniscus is similar to a hangnail. The same way that a hangnail can catch and cause discomfort, a torn meniscus can catch and get pinched between the bones in the knee during regular activities causing pain. Torn menisci can occur as a result of a singular traumatic event, such as an abrupt twist of the knee, or as the result of many years of wear and tear. Everybody knows that fluid imbalances and mild dehydration can trigger muscle cramping. Although, we know that muscle cramps can and do occur with severe dehydration and heat injury, there is no conclusive evidence that consuming adequate fluid with or without electrolytes will prevent typical nocturnal or exercise-associated cramping. In fact, studies have found that runners, cyclists and triathletes who develop cramps during an endurance event are no more likely to be dehydrated or to have lost greater amounts of bodily water than are those who do not develop cramps during the same race. A diet, complete in specific vitamins and minerals, can prevent muscle cramping. Here are some nutrients that can prevent muscle cramping, if incorporated in proper amounts into one’s diet, your chances of being cramp-free during a long match can greatly improve. Sodium is one of the main positively charged mineral ions or electrolytes in body fluid. The body needs sodium to help maintain normal body-fluid balance and blood pressure, and in conjunction with several other electrolytes, it is critical for nerve impulse generation and muscle contraction. Sodium is distributed widely in nature, but is found in rather small amounts in most unprocessed foods. An athlete should not consume a low sodium diet and should always drink regular Gatorade to prevent sodium deficiency. Current guidelines for sodium intake is 2,300 milligrams of sodium—about one teaspoon of salt (one teaspoon [six grams] contains 2,325 milligrams). Potassium is the major electrolyte found inside all body cells, including muscle and nerve cells. It works in close association with sodium and chloride in the generation of electrical impulses in the nerves and the muscles, including the heart muscle. Potassium is found in most foods, but is especially abundant in fresh vegetables, potatoes, certain fruits (melons, bananas, berries and citrus fruits), milk and meat. Calcium found in the body is found in the skeleton where it lends strength to bone. Calcium is involved in muscle contractions, including that of the heart, skeletal muscles, and smooth muscle found in blood vessels and intestines, as well as the generation of nerve impulses. Blood calcium is tightly controlled and regulated by several hormones, including parathyroid hormone and Vitamin D. Adding an extra glass of milk and yogurt for breakfast will assist in helping prevent cramping as well. Magnesium plays an important role in stabilizing adenosine triphosphate (ATP), the energy source for muscle contraction, and also serves as an electrolyte in body fluids. Muscle weakness, muscle twitching and muscle cramps are common symptoms of magnesium deficiency. For example, three ounces of broiled halibut has 91 milligrams of magnesium, and a serving of an artichoke has 101 milligrams, but the grains are the richest in magnesium, one cup of grain, ranging from 100-300 milligrams of magnesium. A registered dietitian, specializing in sports nutrition, can prepare an individual balanced meal plan, including all the proper nutrients to ensure an excellent athletic performance, one that is cramp-free!